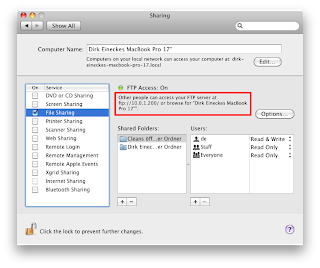 Note: This tutorial uses Snow Leopard 10.6 but in general this also works with older Versions of Mac OS X.
Acitvate "Share files and folders using FTP"
Below the entry "FTP Access: On" you will find a text "Other people can access your FTP server atftp://10.0.1.200/ or browse for “Dirk Eineckes MacBook Pro 17"”." Now you have activated the FTP server and you can access it with any FTP client like Cyberduck or FileZilla. Per default you will be directed to your home directory. 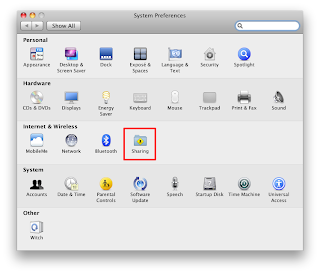 But most commonly you want to access a certain directory on your hard drive instead of accessing your home directory. On the right enter your IP Adress into the field "Host"
Choose "Normal" at the select box "Logontype"
Enter your username into the field "User"
Click on the tab "Advanced"
Enter your favored directory into the field "Default remote directory". 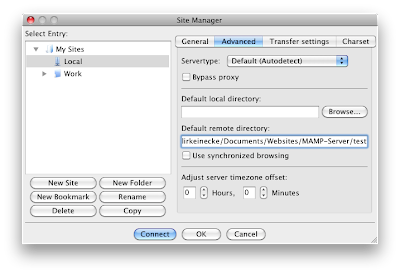 On my system this is: "/Users/dirkeinecke/Documents/Websites/MAMP-Server/test"